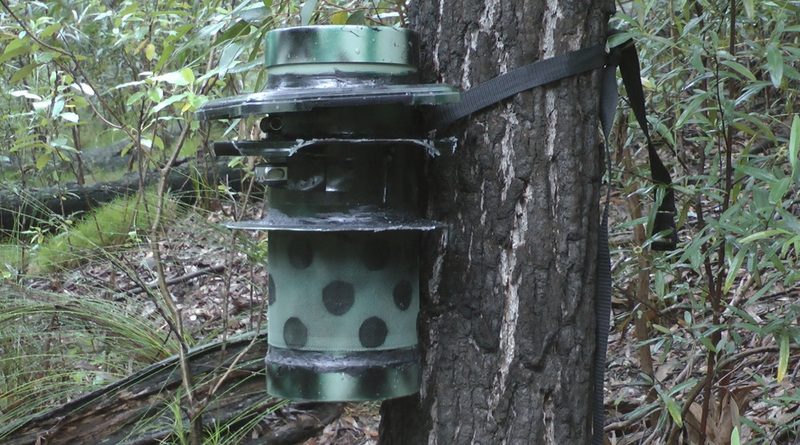 The trail cameras didn't work , they were always sleeping and they weren't sensitive or quick enough to catch the creatures on video but the CCTV camera was working well , so were the telescopic plot watchers . Unlike the trail cameras , the CCTV was never sleeping and captured everything . 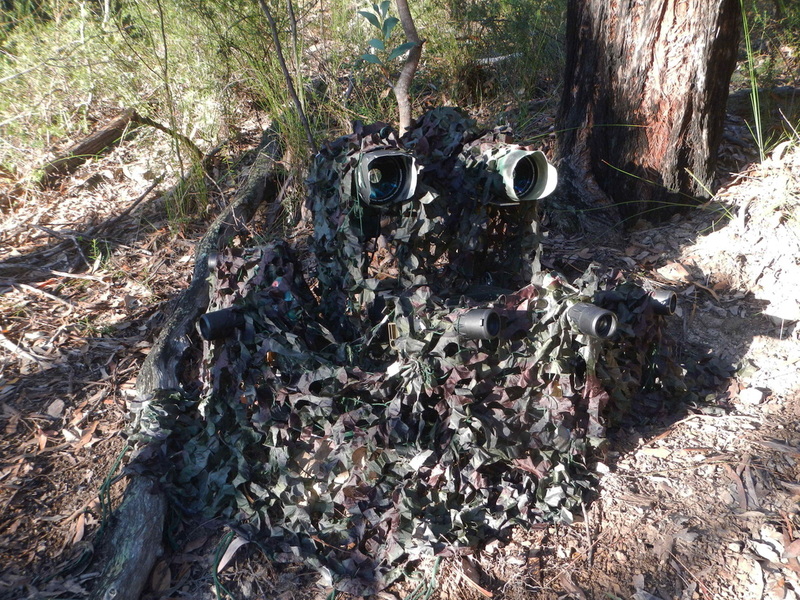 During November 2014 the CCTV camera caught an unknown figure moving quickly across the forest floor and through the vegetation . It was estimated that the subject was around 3.5 feet tall and a speed was estimated to be around 36 kilometre's an hour . The subject didn't appear to have any noticeable ears that may identify it as wallaby or kangaroo , we still cant identify what it is . The telescope seemed to be a good way to get closer to the subjects I was aiming at without them knowing . I now had 7 plot watchers and decided to get another telescope and fix a plot watcher to the telescope . I also fitted the other plot watchers with more powerful lenses . Again , I had to persist and wait to see if it all worked although I wasn't holding my breathe . 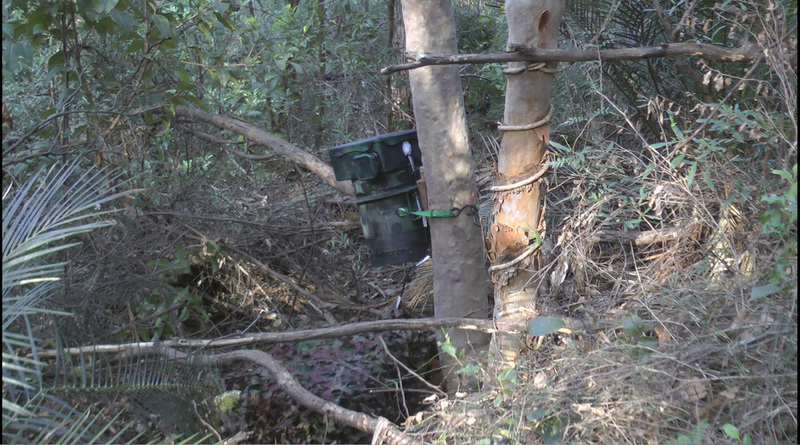 The above camera trap wasn't working . I was placing my setup in open areas and I was guessing where the creatures would peek from . But using powerful lenses actually decreased the odds that the cameras would be facing in the right direction . The lenses were also visible , revealing the nature of the trap . I believed I had the right tools , but what was the correct method ? I had to try something new . I needed to hide the cameras and lenses . I needed a housing that didn't look like a bunch of cameras . 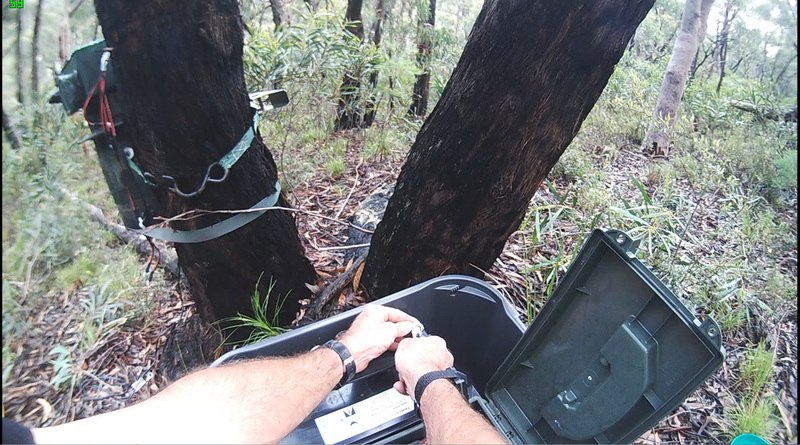 I also needed to move into thicker forest to decrease the amount of places where my setup could be viewed from thereby increasing my chances that the cameras might catch something . I decided to hide the cameras in a piece of industrial plumbing with small holes in the sides so the cameras could see through . I covered the pipe in flyscreen and spray painted the pipe in a camoflagued fashion , distracting attention away from the barely visible lenses . I left the audio recorders exposed to again draw attention away from the camera holes . After 8 months of trialing various versions of this type of camera housing it became quite obvious that something new was happening . They now started cautiously approaching from behind during the day and night which meant to me that they couldn't see the cameras . The above photograph is of myself connecting the power for the CCTV cameras at the battery box . On the left you can see the camera housing facing forward although inside , there were 5 timelapse cameras facing in a 360 degree fashion and 4 CCTV cameras facing to the background and to the sides . Because the new housing was tied to a tree , it gave the impression of facing forward making the creatures approach from behind . This was a new avenue that could be exploited .